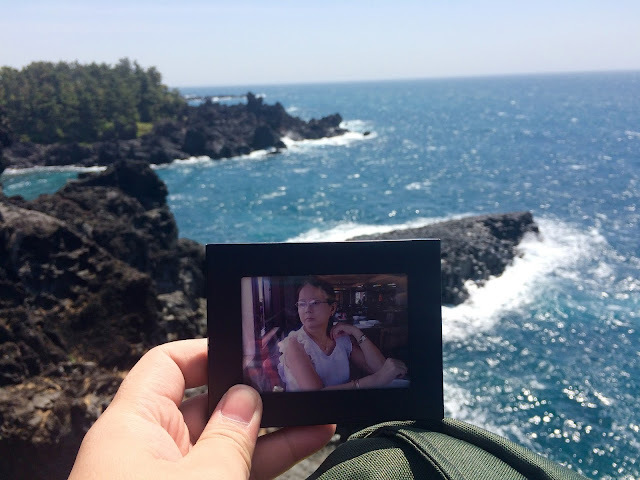 On our third day at South Korea, and also our third and last day in Jeju island, we decided to visit the nearby spots on our hotel. 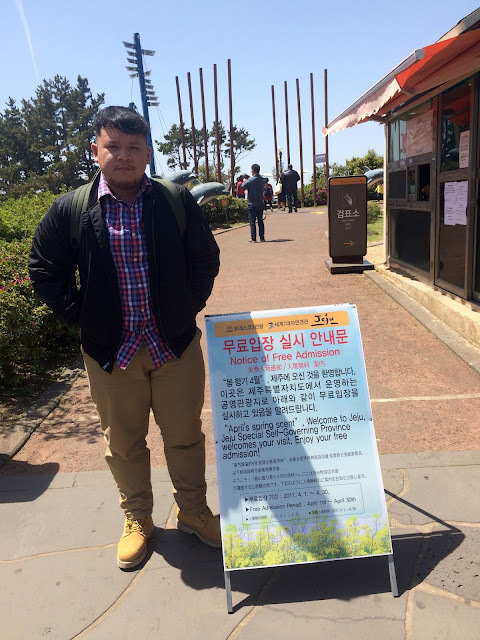 We were staying at Days Hotel Jeju Seogwipo Ocean located at the southern part of Jeju island province. We fixed all our things on our luggage so that when we get back from our short morning nature trip around the city, we'll be ready to go to the airport to board our evening flight back to Seoul. First up, we decided to visit the Jusangjeolli Cliff. 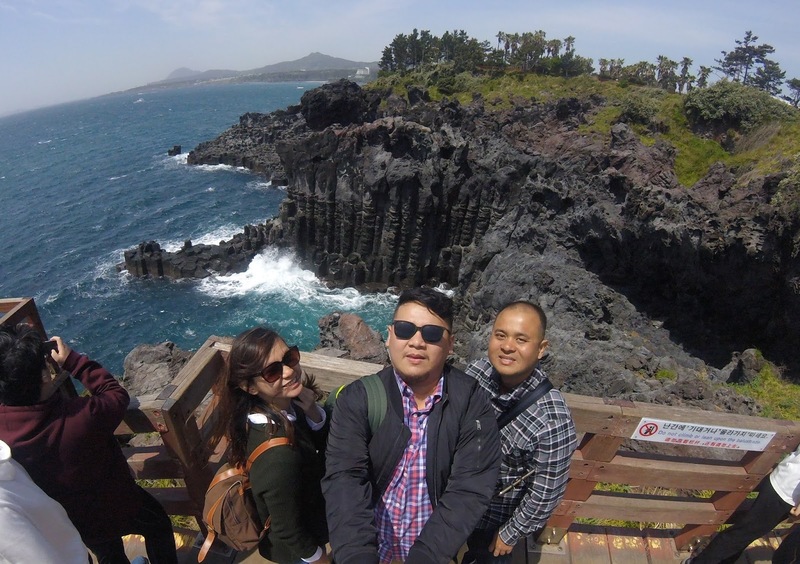 Located about 20 kilometers west from our hotel, the cliffs are one of the famous attractions in the south of Jeju. Tourists flock to see the basalt rock formations on the side of the sea. Since Jeju is an island formed by prehistoric volcanic eruptions, this unusual landscape is one of its products. We rode a cab that took us straight to the attraction. We passed by beautiful condominium complexes and university buildings that are built aesthetically. Everything was paved beautifully and everywhere you look, plants and trees are just growing together with the city's urbanisation. In about 25 minutes, we arrived to our destination. It was amazing when we arrived because there was no entrance fee during that day, this is because of the month-long Spring Festival that the city is celebrating. It was a big thrill because this means that other attractions will also be free of charge because of this celebration. They call this month-long occasion as the "April Spring Scent". Free admission that day due to "April Spring Scent"
We walked just a few feet away from the entrance and the springtime breeze from the ocean just started to embrace us, and then there it is. We are standing on a wooden structure built above the beautiful towering basalt rocks as the wind blew so strong! I was holding on to my glasses since I kept on switching from sunglasses to my corrective lenses but my cousin Judy did not escape the joking breeze when she dropped her sunglasses. Don't worry, it was not on the cliff side, but on the safe side. We waited for the other visitors to pass by us before I dived and reached for it. My Mommy and the amazing view of the Jusangjeolli Cliff. After a few more pictures and breathing in the fragrant ocean breeze, we walked all the way up. I love the spring weather! The sun is up high but it doesn't feel harsh to my skin because the cool wind brushes it off. Just before we left, I saw a tent with an elder Korean guy tending a table with an array of beautiful postcards. I checked each of it and read from its info that the photos were taken by just one name. Then I asked the man and found out that all these photos are taken by him. They are amazing photographs that feature the variety of scenes all around the island of Jeju. I bought a few cards as souvenirs and a few gifts to some friends abroad and then we decided to go to our next attraction. We wanted to see a waterfall but we can't really decide which waterfall to visit since there's quite a few even in Seogwipo itself. 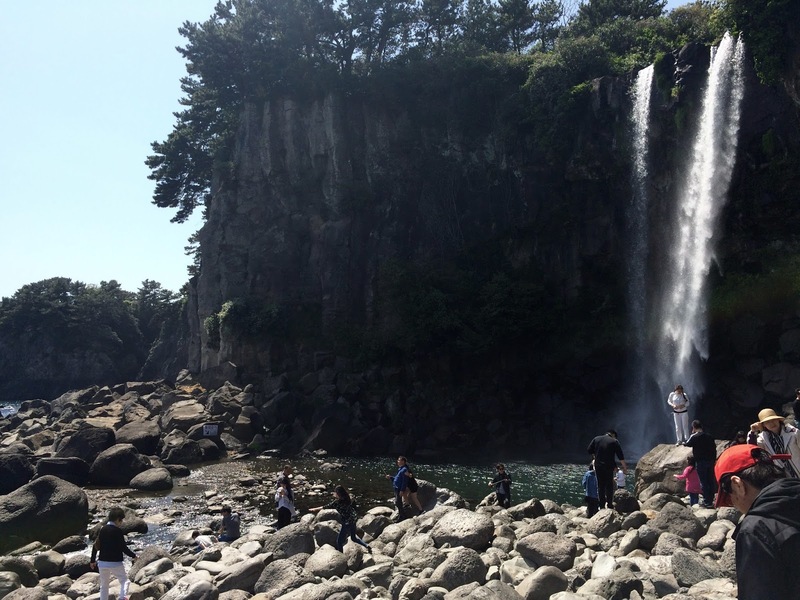 Finally, we decided that we will be visiting Jeongbang Falls which is just about a mile away from the hotel. So we walked all the way out from the attraction park to the highway and took a cab all the way to the waterfalls. We arrived at the heart of Seogwipo and into the seaside where we were dropped off by our cab. We walked all the way inside and reached the beginning of the stairs that descents from the top, all the way to the base of Jeongbang Waterfalls. Even from the middle of the stairs, you will already have a picturesque view of the waterfalls that cascades all the way to the open sea. It was majestic! When I was younger, I always feared waterfalls, especially the force and the sound that it makes, it scares me for real. But then I grew and with it grew my love and appreciation for this beautiful body of water that just brings out life and energy to a destination. There were a lot of tourists that time when we arrived there just past noontime but its beauty is just enchanting. It is the very first waterfall that I have seen that shares a view with an open sea so it was quite astonishing just to be there, stand silently, and just feel the presence of God's creation. 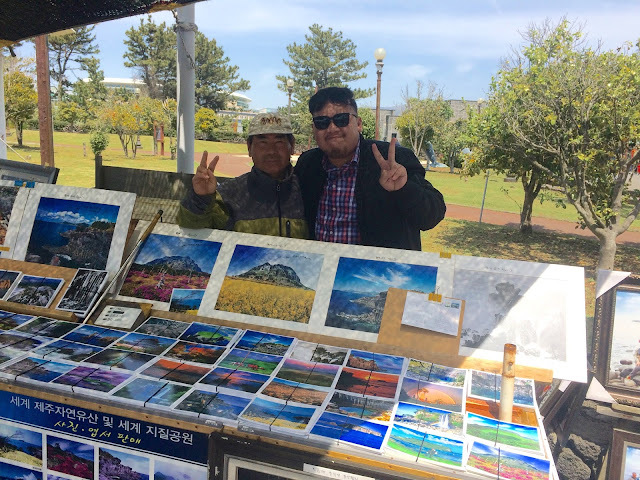 Right after a few pictures and video shots, we decided it was time to go back to the city and grab some lunch before we head back to Jeju International Airport to catch our evening flight going back to the mainland. It was a quick, fast day but these spectacular sights just made all of it extra special.